Neskowin's Proposal Rock and its oddball ghost forest. 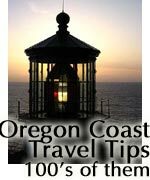 (Oregon Coast) - The craziest things can lurk in some of your favorite, regular beach stops and spots - things you’ve never known were there the many years you and your family visited. Sometimes it's an odd detail about the place that has sat in an obscure corner forever. Others, it’s entirely new vistas and viewpoints you may not have known about unless you ventured a slightly different direction, up a steep hill, or maybe you’ve just driven past it all these years never knew what was there. 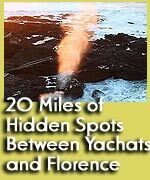 Two of the more interesting examples of hard-to-spot details are two similar objects embedded in the rocks of different beach spots almost 100 miles apart. In both these places, you’ll find metallic knobs, looking like brass, cemented into the rock and bearing some designation from a local electric company. 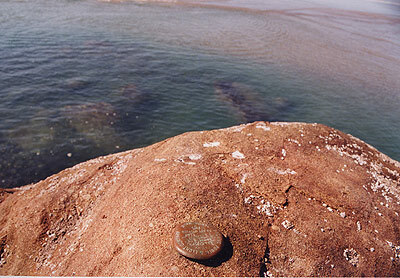 Hug Point: the mysterious knob from an electrical company lurks on the rocky road around the point. 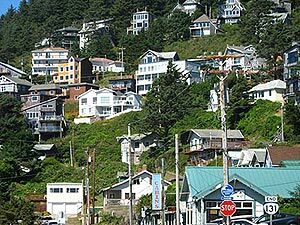 One sits at Neskowin (just north of Lincoln City), and the other at Hug Point (just south of Cannon Beach). Both are obviously quite old, and both seem to indicate the presence of an electrical cable at one point in history. Both are obviously out of place in such a rugged setting. 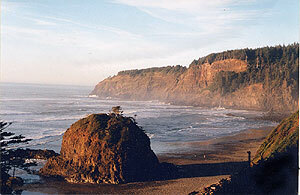 The one at Neskowin sits on the rockface just before the trail atop Proposal Rock. You’ll find it just a few feet away from the trail entrance. Hug Point’s little metal knob is on the north side of the road carved out of the rocky headland, directly across from the remnant of the old traffic light (which kept old Model T’s and horse-drawn carriages from smacking into each other back at the beginning of the 20th century). 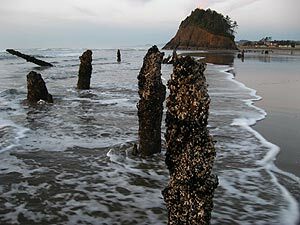 Neskowin also hides another awesome secret: the remains of a 2000-year-old forest, often called a “ghost forest.” To get to these (and Proposal Rock), you have to cross the often wild little stream that slices through the beach. 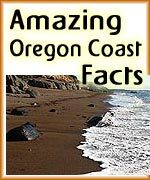 But once there, you’ll find the somewhat grim reminder of Oregon’s crazed geologic history. As many as 100 are sometimes visible in various shapes and sizes. One theory is that around 2,000 years ago a massive, cataclysmic earthquake abruptly dropped this forest possibly more than 25 feet. Another is that over a period of decades, the landscape changed and enveloped the forest in sand and mud. Whatever the case, they were preserved from natural decay by being entombed and hidden from oxygen for thousands of years. 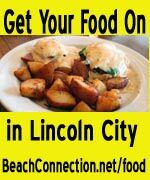 Another favorite detail of many – one that you may have missed unless you were looking closely – sits near the tideline in Seaside. 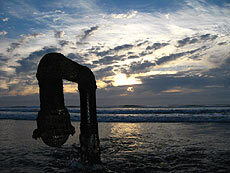 At lower tides, an elbow-shaped pipe is visible, the last remnant of the old natatorium in this 100-year-old resort town. These were saltwater baths that were popular until around the 30’s. Once, that pipe pumped water into the baths. Now, it serves the Seaside Aquarium and funnels fresh seawater into the tanks where all the critters reside. At low tides, when it’s exposed, it houses the occasional sea life surprise that will sometimes jump out at you and scurry away. 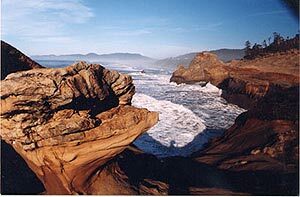 You can visit the Three Capes Loop (west of Tillamook) and revisit it for years and still never see its entirety. This oceanfront drive begins and ends where Highway 101 veers inland – a roadway full of twists and turns in reality and metaphorically. Cape Kiwanda has long been a favorite of beach-goers, including the steep slope you have to tread to explore this amazing headland. If, for some reason, you’re one of the few who haven’t made that trek – do it, and do it soon. For those who have climbed around on top, there may still be surprise views you didn’t know existed. Some of the more shudder-inducing wonders lay at the cape’s northern end. Don’t pass up wandering into the bowl-like area that’s like a mini-cove, either. That’s an experience you won’t soon forget. 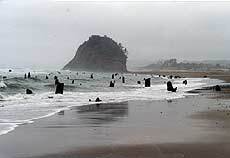 Between Oceanside and Cape Meares, along the Three Capes Tour, you may have passed a small beach with a blob-like rock, looking not too dissimilar to Neskowin’s Proposal Rock. This is Short Beach, a seriously secret beach that is bordered by outcroppings north of Oceanside and the cliffs of Cape Meares. It’s not hard to find yourself alone here, and well worth the leg cramp-inducing “walk of a thousand steps” that takes you down. Look for the sign for Radar Road and park near there. Also astounding, but in the manmade department, is wandering the hilly neighborhoods above Oceanside. Some beautiful, innovative and even wacky homes inhabit these steep streets. Take a drive – or a walk – up the hill and just wander aimlessly. You’ll discover homes in some strange shapes, interesting colors and with all sorts of personality. From geodesic domes and angular, twisted designs to old Victorians painted brightly, this is a true street of dreams. There are other delightful secrets you may have passed by along the Three Capes Tour (or Loop, depending on which you prefer). This is a place that demands slow exploration. Freaky meat-eating plants at Florence. Down in Florence, one such destination is the Darlingtonia Wayside, which features insect-chomping plants that mostly live between there and northern California. These rarities sit around, just waiting to catch bugs with their sticky parts, then slowly digest them. The wayside is free and is on the north end of Florence, just off 101.